It’s been quite a while since I posted any logs. I picked out my best ones from the last 2 months. Equipment: Tecsun PL-880, 225 foot long wires oriented for different directions, EmTech ZM2 Antenna tuner, DX Engineering RPA-1PLUS HF PreAmp and EmTech ZM2 antenna tuner. 7315 kHz, The Voice of Vietnam via Cypress Creek, South Carolina from 0100 to 0115UTC on September 22. The program begins with the incredibly recognizable and lovely VOV interval tune/intro signal. A female announcer gives a quick preview of the show and headlines then a news report begins.with a male. I would give this broadcast a SINPO of 34233. The signal was pretty fair, listenable but with lots of atmospheric noise/fading/static, but thankfully no interference. Audio here: https://www.youtube.com/watch?v=e_PH8MraW7A. VOV also heard at 1624UTC on 7220 kHz via Hanoi with a traditional Vietnamese song and a SINPO rating of 33232. The signal itself was ok but there was a lot of noise, fading and at times, interference which resulted in my overall poor rating. The signal itself was ok but there was alot of noise, fading and at times, interference which resulted in my overall poor rating. Audio here: https://www.youtube.com/watch?v=G9Kf2AYVeDA . 1209 kHz via Hanoi at 1130UTC is heard at fair to good levels from with a little fading and noise but not bad overall. Audio here: https://www.youtube.com/watch?v=VIFVztEl1yM . I would give this a SINPO rating of 44343. This signal was on the lower side of good but the overall quality was the higher side of fair due to the fading, noise and slightly low modulation. Paul Walker is the Program Director at Community Radio For Alaska: KIYU located in Galena, Alaska and is a regular contributor to the SWLing Post. Be sure to check out Paul’s YouTube channel and SoundCloud channel where everything he logs is recorded and posted. Click here to read his other contributions on the SWLing Post. This entry was posted in Broadcasters, News, Recordings, Shortwave Radio, What's On Shortwave and tagged All India Radio, Deutsche Welle, Paul Walker, Radio France International, Radio Guinea, Radio Rossi, Radio Sahka, Radio Taiwan International, Radio Thailand, Shortwave Radio, Sri Lanka Broadcasting Corporation, Voice of Mongolia, Voice of Turkey, Voice of Vietnam, Zanzibar Broadcasting Corporation on September 28, 2016 by Paul Walker. As is my typical style, I’ll do some DX’ing for weeks, if not a month or more before I sit down and write out logs. I focus on logging and recording first, then writing reports later as I’m worried i’ll miss something on the dials. I have a few good ones this time around, like usual. Lets get on with the logs! There are a few good ones here, including The Voice of Mongolia 12035 kHz, Vivdh Bharati on 9870 kHz and others along with some usuals. 2850 kHz, 3250 kHz & 3320 kHz, The Voice of Korea via Pyongyang to North Korea and the Far East in Korean on August 2, 2016 from 1623 to 1627UTC. The tropical band signals of VoK are somewhat rare and kind of weak during the summer but much more regular and stronger in the winter. This time around, 2850 kHz is the strongest with a woman singing in Korean. The signal is weak but easy to understand despite the noise. 3250 kHz and 3320 kHz both featured a man talking, 3250 had a song shortly after my recording began. 3560 kHz wasn’t heard on this date, but it was heard back on July 23, 2016 at 1502UTC with a pretty weak signal, full of noise, yet music was definately heard above the buzzing! 2850 kHz audio here: https://soundcloud.com/onairdjpaulwalker/vok-2850-august-2-2016-8-23-35. 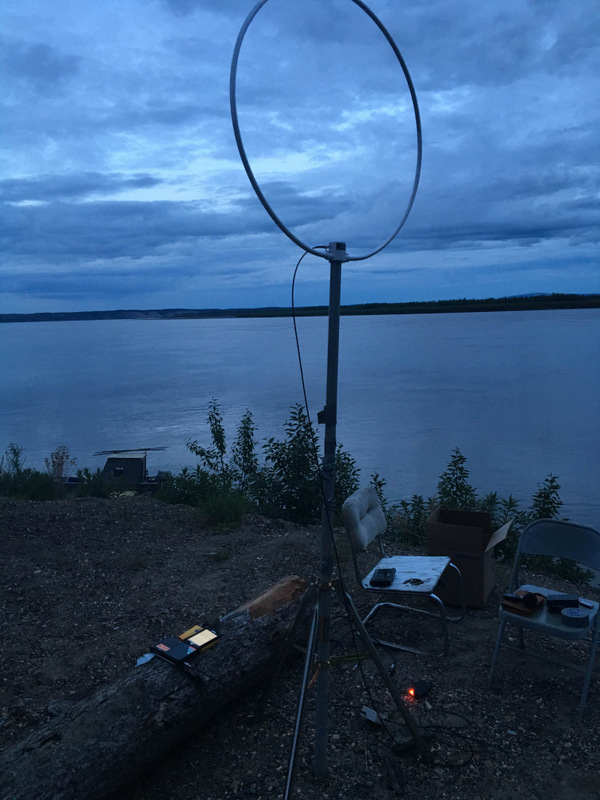 Paul Walker is an avid Shortwave DX’er located in Galena, Alaska working at “Community Radio For Alaska: KIYU” as Program Director and is a regular contributor to the SWLing Post. Be sure to check out Paul’s YouTube channel and SoundCloud channel where everything he logs is recorded and posted. Click here to read his other contributions on the SWLing Post. This entry was posted in Recordings, Shortwave Radio, SWLers and tagged Alaska, All India Radio, BSKSA Holy Quran, Deutsche Welle, DigiDX, Echo of Hope, Galena Alaska, HLL Seoul, Paul Walker, Radio Algerienne, Radio Romania International, Radio Taiwan International, Radio Thailand, Radio Thailand World Service, RWM Moscow, Solomon Islands Broadcasting Corporation, The Voice of Mongolia, Vivdh Bharati, VOA, Voice of Greece, Voice of Mongolia, Voice of Turkey, Zanzibar Broadcasting Corporation on August 5, 2016 by Paul Walker. Here are some Shortwave logs from the central interior region of Alaska. I used a Tecsun PL880 and 225 foot long wire with Emtech ZM2 Tuner or a Wellbrook ALA1530LNP. I’ve only used the Wellbrook for two days so I can’t really offer a thorough comparison yet. There was one case in particular where the 225 foot long wire and ZM2 tuner beat the Wellbrook by a large margin. I hear China Radio International, China National Radio, Radio Nacional de Brasilia/Amazonia, FEBC, World Harvest Radio and others regularly so I don’t log them because I try and keep my logs to what is interesting for one reason or another (programming, music, etc.) or rare/interesting. 4870 kHz Indonesia, Radio Republik Indonesia Wamena. June 12 1001 UTCA regular visitor in the early morning hours here. not daily, but here often. Today’s signal is fair but with a moderate amount of fading and static crashes/interference. Usual fair of what I think is local music is being played. 5020 kHz Solomon Islands, Solomon Islands Broadcasting Corporation. June 12 1011UTC. Higher side of good signal with all factors taken into account. Only a little bit of fading during christian music. 5745 kHz US, VOA Radio Gram. June 11 0943. The first time I logged VOA’s Radio Gram broadcast. There was something creating a loud buzzing noise but I could still hear the digital data. Only a little Russian text and text in english decoded for me. I will definitely try again! 6070 kHz DPRK, Voice of Korea.June 11 1005UTC. Fair signal, but low modulation. Announcers voice is lower then the music. Fair amount of fading. I heard their usual marching/patriotic music. This is not a frequency I usually hear them on, wether owing to I am not out when this frequency is on, conditions or I hear usually CFRX Toronto. 6115 kHz China, Voice of Strait. June 11 1008 UTC. Fair signal with a fair amount of fading. Sounds like a man talking, could be a news broadcast or interview. Not sure. 9545 Solomon Islands, Solomon Islands Broadcasting Corporation. June 11 0835. SIBC was on over 3 hours late on 9545 kHz, it’s supposed to sign off at 0500UTC and switch to 5020 kHz but at 0835UTC this night it was still on. 9545 kHz staying on late has been happening a lot lately. 9545 kHz is used as SIBC’s workday frequency with 5020 kHz being used in the early to mid morning and afternoon/evening. In this recording SIBC is fairly strong here with light fading and static. Whenever 9545 kHz is on late, it seems to be stronger then 5020 kHz would be. My logging tonight starts with an interview then music is being played. 12035 Mongolia, Voice of Mongolia. June 11 1018UTC. NEW! This is a new logging for me. weak signal playing music. Was able to match the interval tune and the announcers voice heard during my logging with a clip of a recent broadcast on their website. 15400 kHz Romania, Radio Romania International. June 12 1006 UTC. News broadcast in French. Somewhat weak, but steady signal with only light fading. 17770 kHz Phillipines, Radio Liberty targeting Siberia. June 12 0948. What sounded like a man in Russian during a news broadcast or interview. Weak but steady signal. I am DXing about 500 feet from the transmitter sites for KXES-LPFM 92.9 and KIYU-FM 88.1 along with K10LJ Channel 10. The FM’s are only 100 watts and the TV station is only 10 watts of Digital RF. However, the FM’s overload my Shortwave radio around 9.4 to 9.6 MHz along with the lower to mid part of the tropical bands. I have a MCM Electronics and Radio Shack FM trap and they help a bit, but don’t do nearly enough. I am willing to spend $100 or so for a good FM Trap/Filter. I’ll spend a little more if I have to and the product is proven at works. I can null out the interference by rotating my Wellbrook ALA1530LNP, but I may be nulling out the signal I want to hear at the same time. Returning things for me is a hassle so I’d rather pay good $ for something that works. Feel free to email me, walkerbroadcasting@gmail.com or reply to this thread. Paul Walker is located in Galena, Alaska and is a regular contributor to the SWLing Post. Be sure to check out Paul’s YouTube channel and SoundCloud channel where everything he logs is recorded and posted. Click here to read his other contributions on the SWLing Post. This entry was posted in Guest Posts, News, Shortwave Radio, SWLers and tagged Galena Alaska, Paul Walker, Radio Liberty, Radio Vanuatu, Rado Romania International, Solomon Islands, Voice of Mongolia, Wellbrook ALA1530LN Pro on June 13, 2016 by Paul Walker. Thanks for sharing your travels, Mark! This entry was posted in Broadcasters, Videos and tagged Mark Fahey, Mongolia, Videos, Voice of Mongolia, Voice of Mongolia Antenna Farm, Voice of Mongolia Transmitter Site on March 10, 2013 by Thomas. SWLing Post reader, Chris Johnson, recently sent me a message confessing his love of travel combined with shortwave radio listening. When he told me about his enviable plans to travel to the tiny islands of Truk Lagoon in the Federated States of Micronesia–and to record some of the broadcasts he heard–I asked if he would allow me to share his recordings on the Post. Fortunately for us, he agreed! Voice of Korea; Recorded on a Sony ICF-SW7600G using a whip antenna. 7 February 2013 on 15100 khz at 0500z Location; Puka Beach, Boracay Island, Philippines. The program was scheduled for 60 minutes but due to the frequent power outages in the DPRK, the program ceased at approximately 52 minutes. This entry was posted in News, Recordings, Shortwave Radio and tagged Chris Johnson, Mongolia, North Korea, Shortwave Radio, Shortwave Radio Recordings, Truk Lagoon, Voice of Korea, Voice of Mongolia on February 28, 2013 by Thomas.